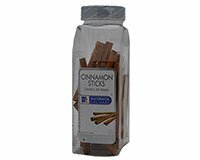 McCormick Cinnamon Sticks come from the bark of a small tropical evergreen tree native to the tropics including Southeast Asia, Sri Lanka, Java, Egypt, West Indies, Madagascar, and Brazil. The tree grows to a height of 30 to 45 feet. Use Cinnamon Sticks as stirrer in coffee, teas and other hot drinks such as spiced apple cider. Cinnamon Sticks are also used to season asian soups, stews, chili, and as a dessert topping. This is a large container of McCormick Cinnamon Sticks. It's packaged in bulk PET plastic container. Fire Vodka (Krupnik) More Recipes..